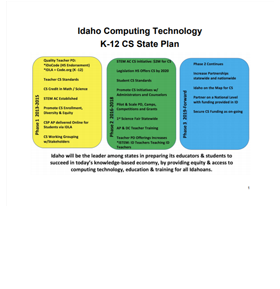 IDAHO IS A COMPUTER SCIENCE LEADER according to Code.org. Code.org is a national non-profit dedicated to expanding access to Computer Science in schools and increasing participation by women and underrepresented minorities. Their vision is that every student in every school has the opportunity to learn Computer Science. 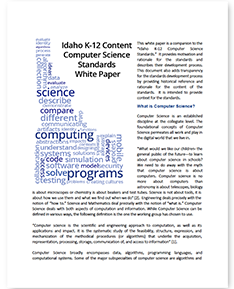 They have come up with nine policy recommendations that every state could adopt to help move Computer Science Education forward. Idaho is now the second state in the nation behind Arkansas to implement all nine. 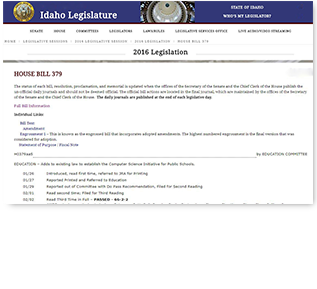 Click here to read all nine recommendations and more Idaho statistics. Read the Code.org Blog Post! Now what? Computer Science (CS) Education Week was December 3-7, 2018. Many educators hosted Hour of Code with their students and there were over 500 CS events across Idaho. Hour of Code is a one-hour introduction to computer science where anyone can learn the basics. Did you participate in CS Education week and need more resources or ideas on next steps? 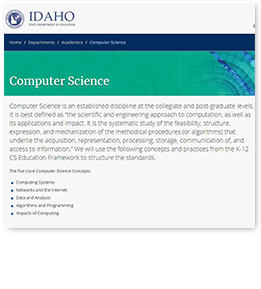 Or are you just wondering what type of computer science resources are available? 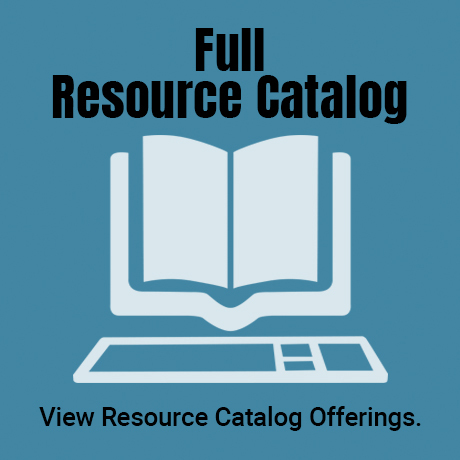 Check our Resource Portal. (Click on the Full Resource Catalog tile and then search for CS or Computer Science). Here you will find an array of activities and resources for you and your students.